Sock Summit 2009 is celebrating the diversity of sock knitting in Portland, Oregon from Aug. 6 – 9. Close to 40 of the finest sock specialists will gather at the Oregon Convention Center to teach knitting enthusiasts how to knit odd socks, historically accurate socks, boot socks, warm socks, lacy socks, and even elegant socks. You can learn how to make argyle socks, Bavarian stockings, Toe-up Socks for the Stubborn, or Turkish stitches. While taking a break from classes you can browse the marketplace, which has more than 150 venders, selling everything from yarn, needles, bags, patterns, jewelry, and art. You can also attend an old-fashioned sock hop or a lecture on the history of socks. Laurel Hill will be selling our exotic, handmade and sustainable needles and hooks at the Sock Summit marketplace. To learn more about the Sock Summit 2009 visit the Sock Summit website. Crochet! Magazine acknowledged Laurel Hill as an innovative, environmentally friendly, and socially responsible company in its July 2009 edition. 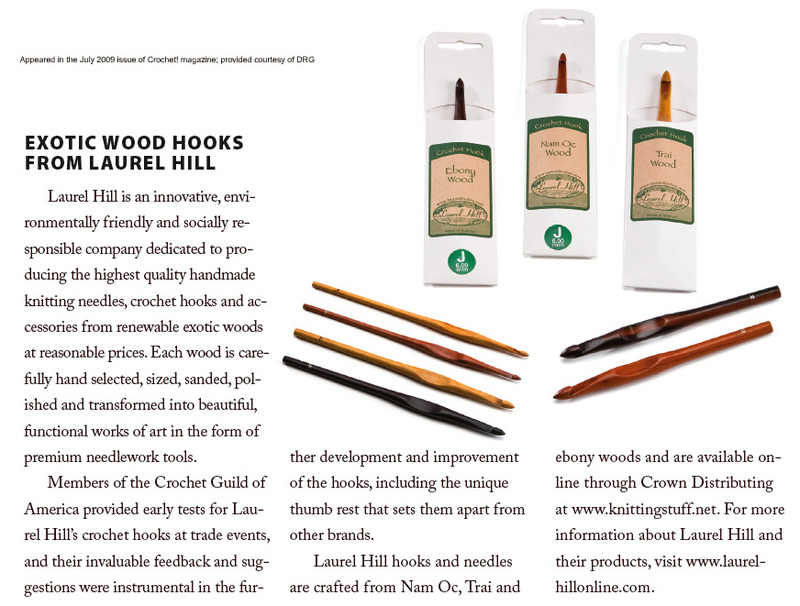 The article focused on Laurel Hill’s crochet hooks and needles, which are crafted from Nam Oc, Trai and ebony woods. Each wood is carefully hand selected, sized, sanded and polished to create premium needlework tools. According to the article, Members of the Crochet Guild of America provided the early tests of Laurel Hill’s crochet hooks at trade events, which gave valuable feedback and suggestions. For example, their suggestions led to the creation of the unique thumb rest that sets Laurel Hill’s crochet hooks apart from other brands. For more information view the original article from Crochet! Magazine. There is a new form of graffiti hitting the streets, but it is extremely pleasant. Urban knitting, also called “guerrilla knitting,” is being spotted more and more in the streets and in public places all over the world. A group of inspired knitters, who call themselves the “Knittas,” started the urban knitting trend in August 2005. The group began when the soon-to-be-Knittas were discussing their deep frustration over unfinished knitting projects: balls of yarn gathering dust and half knitted sweaters. Once the group knit its first door handle the rest was history – Knitta was born! The Knittas knit everything from trees to public monuments and utility poles. Visit the Knitta photo gallery to get inspired! There is no better summer activity than sitting on a back porch with a set of needles and yarn. Summer is a time to relax and let your creativity flow. In the spirit of summer, I have been knitting a cotton bag to take to the beach. Cotton is cooler than wool on hot summer days. Summer art projects for the whole family to enjoy. Kool-Aid is great for a cold summer drink, and to dye your yarn. Dazzle your dinner guests with some great seasonal, summer recipes. Tired of hearing “I’m bored!” from your kids? Then teach them to knit too!